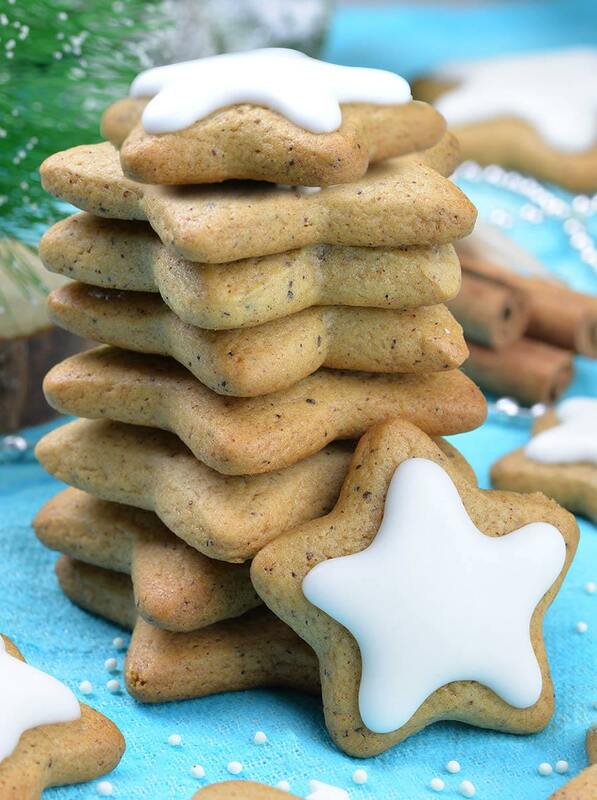 Star Gingerbread Cookies is perfect, delicious, sweet and spicy, easy Christmas cookie recipe you are all looking for. Gingerbread cookies with molasses, ginger, cinnamon and nutmeg are Christmas classic. 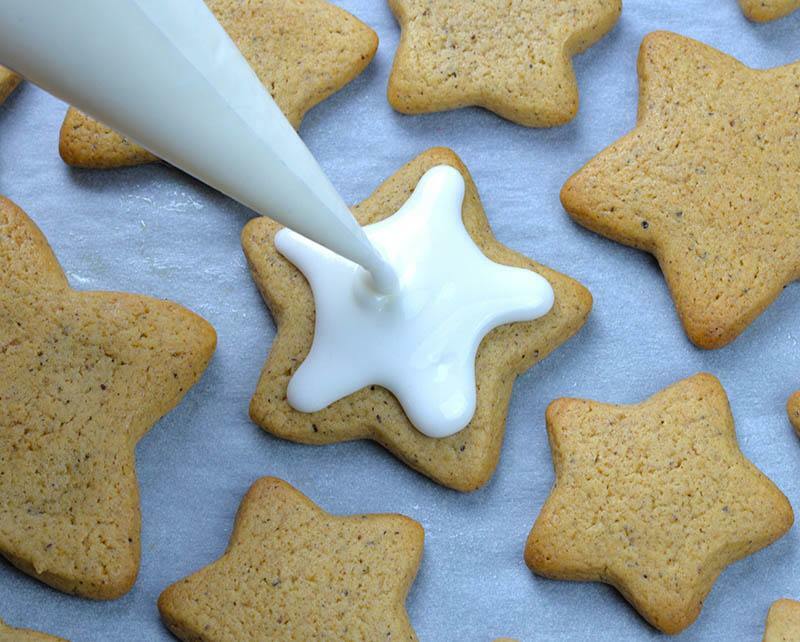 But if you are bored with traditional Gingerbread Man, I suggest you to make these cute gingerbread stars with white icing, instead. However, these cookies will look so petty and fancy at your Christmas table for holiday. Also, I’m sure that Santa would love to find a few of those cookies when he drops by at your home to deliver the presents. And Christmas is just around the corner! So, everybody need a lots of delicious cookie recipes, right?! And Christmas is just around the corner! So, everybody need a lots of delicious cookie recipes, right?! Also, you should check my older Christmas Cookies Recipes like: Christmas Maraschino Cherry Shortbread Cookies, Coconut Snowball Cookies, Red Velvet Crinkle Cookies, White Chocolate Strawberry Shortbread Cookies, Santa’s favorite White Chocolate Cranberry Cookies, Peanut Butter Chocolate Chip Shortbread Cookies and my newest on the blog- Soft Chocolate Chip Cookies. 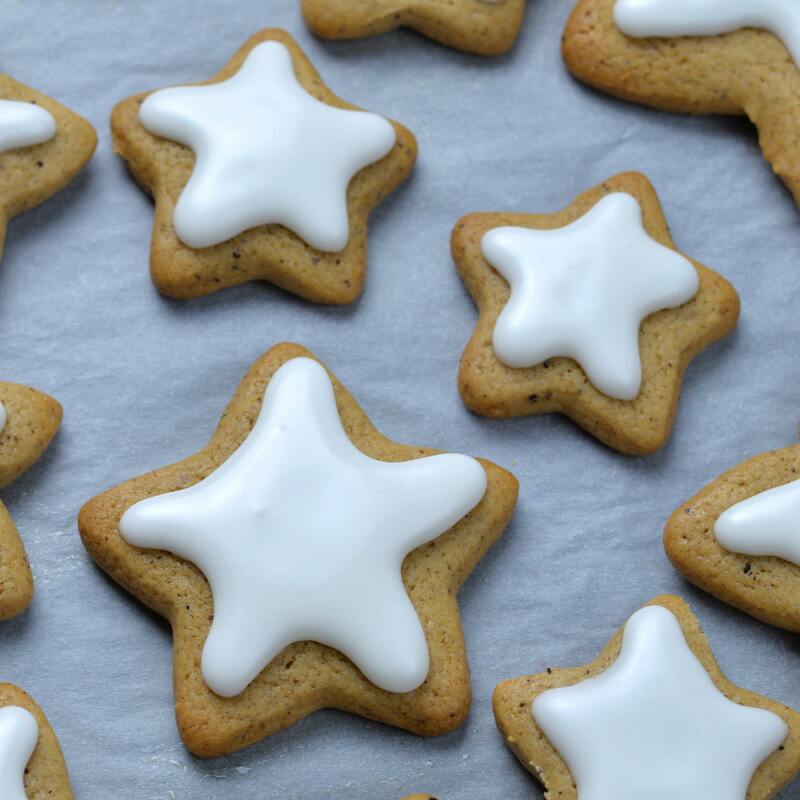 But if you want to stick to the classic, with this Star Gingerbread Cookies Recipe you’ll make the best ever gingerbread for your Christmas cookie tray. This Star Gingerbread Cookies Recipe uses brown sugar and molasses. Also ground spices, ginger, cinnamon and nutmeg gives beautiful aroma to these cookies. Finally, the smell of warm spices while the cookies are baking is out this world!!! Filling your house with the best-ever aroma of spicy gingerbread cookies is so comforting during these cold days. Therefore, these traditional spice cookies are just right for the holidays. 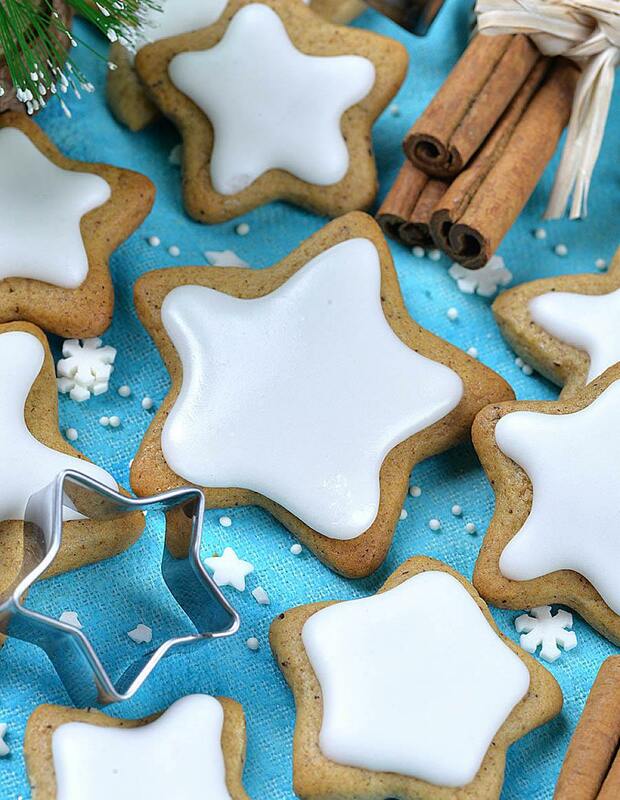 So, try this Star Gingerbread Cookies recipe and you’ll know what I’m talking about! These gingerbread cookies are both fun and simple to make. And what’s more, the kids will love them, too! 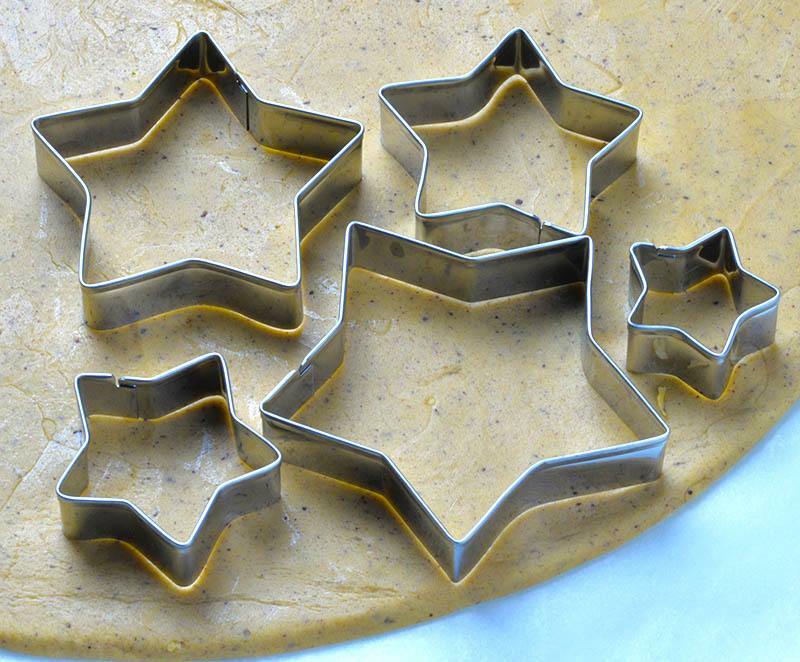 These cute stars make a lovely homemade Christmas present, as well. These Star Gingerbread Cookies are perfect, delicious, sweet and spicy, easy Christmas cookie recipe you are all looking for! First stir together dry ingredients: flour, baking soda, salt and spices, set aside. Then, in a large mixing bowl cream together butter and sugar. Add molasses, egg yolk and vanilla. Mix to combine. Now, gradually mix in dry ingredients and mix until it’s fully incorporated. The batter should be thick and slightly sticky. If it’s too sticky add a tablespoon of flour at the time, but do not dry it out too much. If it looks sandy add a Tablespoon of milk to clump together. Next, divide batter in half and roll out each half of the dough (about ¼ inch thick) between two sheets of parchment paper. Then, transfer the dough with parchment paper onto baking sheets or large trays and place in the freezer to firm (about 25 minutes or until firm enough to cut with cookie cutter). When ready to bake, preheat the oven to 350 F and line two baking sheets with parchment paper. Bake about 8-10 minutes, depending on size of cookies. Let them cool for 5 minutes onto baking sheet, then transfer on a rack to cool completely. When the cookies are cool completely, make the icing. Whisk together meringue powder and water until a slight foam forms. Then add powdered sugar and mix for about 2 minutes, until smooth, light and airy. If it’s too thick add a teaspoon of water at the time. If it’s too thin add more powdered sugar. Transfer the icing into a zip-lock bag and cut off the small corner or use a piping bag with a small round tip. Drizzle the icing onto cooled cookies. How much brown sugar? Ingredient and amount is missing. Hi Joan, thanks for noticed that! It’s 1/2 cup, I’ve just corrected the recipe!